The process for winterizing your pool involves many critical steps, due to which majority of inground pool owners prefer to let the professionals conduct the necessary winterizing and swimming pool maintenance. Winterizing the swimming pool installation can not only help the owners to protect their pool from hazards caused by cold weather but also prevent the growth of algae in the pool, preventing your pool from becoming a germ factory over the closed months. Many pool owners who are facing the cold weather with their swimming pool, for the very first time can benefit from our couple of Dos and Don’ts. Examine your pool for leaks and cracks regularly. The cracks should be repaired and healed right away. Cleaning the pool does not only mean that you need to remove all the extra elements from your pool. Cleaning and pool maintenance requires skimming of water, vacuuming of the pool floors and brushing the interiors of the pool. Also, letting the debris, cracks and other object rest in the pool can invite some serious problems when you re-open your pool next year. 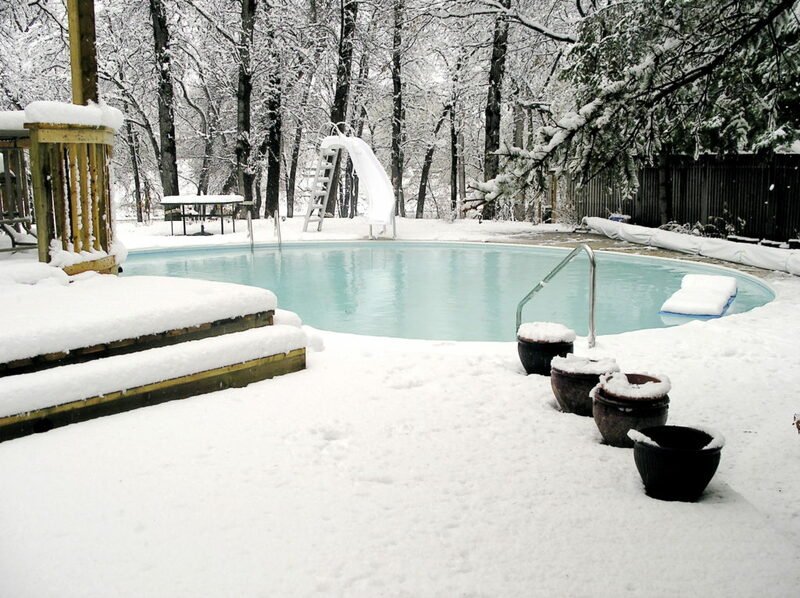 Once you are set with pH balancing and shock treating your pool, you can add winterizing chemicals into the water. The chemical kit can help your pool fight against the proliferation of algae, helping the pool to remain clean when opened again. There are many who use the covers with old patchworks and duct tapes around tears. This one is for them. We always emphasize on having a quality winter cover for your pool that keeps the animals and debris away when closed. Never fully drain your pool. The level of draining of the pool depends on your pool’s material of build. Maintain that level. This is a tricky step, due to which most pool owners call professionals to drain their pool. Do not turn the pool filter off for weeks before winterizing your pool. Even though you are not swimming in your pool, your pool water should be balanced and kept treated all the time. Before closing, an expert personnel will check your pool’s pH level and treatment, to ensure that you have a proper winter closing. The task becomes more difficult when the filter is not running for a couple of weeks. Winter swimming pool maintenance takes a lot of time and effort. Pool professionals can ensure that your swimming pool maintenance is carried out efficiently. They are the swimming pool maintenance guides so never be scared to reach out to them. If you are looking for reliable professionals to take over your swimming pool maintenance and repairs, Land-con is the company for you. With more than 20 years of experience, we are considered to be among the top swimming pool maintenance companies in Toronto. We offer all kinds of swimming pool installations and are happy to provide all the services related to them. Call 416.504.5263 to get in touch with us. Also, do not forget to ask for a free consultation!